1. Quincy Wilson – 2003 vs Miami – The 1-3 Mountaineers went in to the Orange Bowl to play the undefeated, #2 ranked Miami Hurricanes and almost pulled off one of the biggest upsets in school history when Quincy Wilson ran around and over Miami’s defense for a 33-yard TD with less than 2 minutes remaining. On 3rd and 13, Quarterback Rasheed Marshall threw a screen pass to Quincy Wilson. Wilson side-stepped Vince Wilfork, broke a tackle and then ran over Miami’s Brandon Meriweather to give WVU a 20-19 lead. Miami came back to win when Freshman kicker John Peattie kicked a field goal to put them up 22-20. 2. Darwin Cook – 2012 vs Clemson in the Orange Bowl – This play also happened in the Orange Bowl in Miami. West Virginia was up 21-17 with just under 11 minutes left in the half and Clemson ready to score at the goal line. Andre Ellington appeared to run it in for a touchdown, but Darwin Cook stripped the ball from him and took it 99 yards the opposite way for a West Virginia touchdown. This was the “straw that broke the camel’s back” in a 70-33 WVU rout of Clemson in the 2012 Orange Bowl. 3. 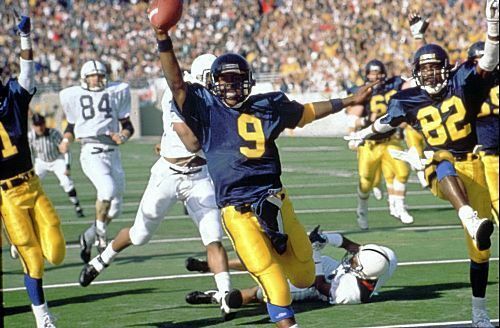 Major Harris – 1988 vs Penn State – Major Harris forgot the play call and the entire Mountaineer team went one direction and Harris went the other before a national television audience and a packed Mountaineer Field. This busted play ended up being one of the most iconic, memorable plays in West Virginia Football history and the 2nd time that the Mountaineers beat the Nittany Lions in 33 years. 4. Pat White -2005 vs UCONN – Look, Pat White had numerous amazing runs and throws at WVU, but this unreal block on a UCONN defender truly showed his competitiveness and desire to win more than any of his other many highlights. 5. Owen Schmitt – 2007 vs Oklahoma in the Tostitos Fiesta Bowl – This was a huge win in WVU football history. With Bill Stewart taking over as Head Coach after Rich Rodriguez left to take the Michigan job, West Virginia played one of its best games in program history, beating Oklahoma 48-28. There is no more memorable play during this game than Owen Schmitt’s 57-yard “runaway beer truck” run.